After yesterdays post, I have decided that quite rightly, I shouldn't have any regrets where clothes are concerned-lifes's too short!! I am very fortunate to have a lovely wardrobe anyway and I thought I would post my current favourite things !! My darling younger son, Robert-he is nine and rocking in his batman pyjamas-ha ha!! My favourite plain colour dress of the moment-my weekend bargain! Plus my favourite bag and sandals of the moment!! What are your favourite things of the moment? A dress, handbag, shoes, family member, anything!! Have a look, enjoy and stay stylish ! ps : if you want to switch links, be my guest ! i'd love to link up...great black dress by the way, i'm looking to add something similar to my closet. Call me crazy, I really don't have a fave piece of clothing or accessory - I think there are moments&places for everything. My totally favorite "things" are and will always be my mum&sister, my bf, and closest friends. Everything else comes&goes. This is a great idea for a post! I have been beating myself up for a week or two about getting rid of my doc martens, but I wasn't really wearing them at the time. My favorite things are probably the little skirts I've made with my mom recently, I also am just enjoying returning to my summer clothes. Shoes, to be honest, I'm wearing flipflops alot, even though I guess their oldnaviness might make me lose a little style cred! My fave person is one of my best guy friends who just came back from graduating college and is only in town for a few weeks! Hi Kamel!! Thanks for stopping by my blog-your blog is very stylish and has amazing photos-alas, I am not fluent in french, so cannot understand your posts! Hi Juliam-thank you and yes, a LBD is very versatile, especially in the summer-it can be dressed up or down-pleased to trade links, BTW!! Hi Dearest Ida!! Your attitude is totally refreshing and you are really so right in what you say-there are moments and places for everything is so, so right! I totally admire this in you and your last comment is excellent-I am certainly wanting now to have this philosophy in life! You're a great gal, Ida!! Hi Pamcasso!! Hope you get to spend some quality time with your friend-these are certainly the memories you will remember in time to come! Yes, now summers here, I love getting out the flip flops too-a very unstylish statement, I'm afraid!! Thanks so much, Wendy-they're good boys and I'm a lucky mum!! Hi fashionable obsessions-what a coincidence from two great thinkers-ha ha!! You've lined up my summer reading material, though-thanks!!! I have nothing but good things to say about your blog. I love your style very much. You're a gem! Hi Apricot-thanks for stopping by my blog with your very kind comments!! Hope to swap links-love your blog, too! Great look, love batman!Haha. Love your dresses. 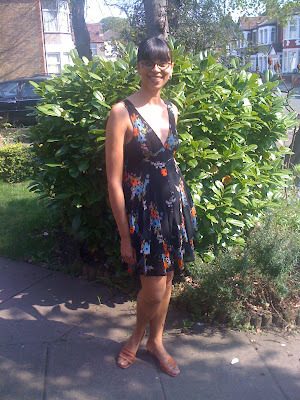 I am into flowerdresses and gladiators at the moment, cant seem to get enough!! Hi Silje-yes batman rocks, doesn't he-ha ha!! Yes a totally stylish and brilliant combination, I think too!! Give me florals anyday! My favourite things at the moment? My best friend and my family! Your sons are very cute. And so is your Celia Birtwell dress! I like Robert's batman pjs so much. Hi Nadine- Yes thats definitely the right favourites to have forever and ever!! Hi August-thanks so much-they're lovely boys! This is currently my favourite CB dress! Hi Wendy-yes he's being stylish accidently on purpose-ha ha!! Hi pammish-what wonderful comments-you've made my day!! Thanks!! Hi fashion chalet-thanks so much! !It is my favourite floral!! My favourite thing at the moment is my newest pair of Bruno Magli vintage pumps. The best thing is my own vintage, cause my mom bought for me about 15 years ago and i never used, i found those looking in the room where my parents keep usually the shoes! Hi alice!! Wow, thats amazing you still have these clothes-thats the best vintage you can hope for! !